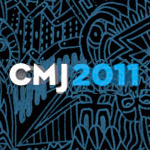 The CMJ Marathon 2011 is set to go down on the dates of Oct. 18 - 22, 2011, in New York. It's put on by the College Music Journal, a long-standing publication of alternative music. CMJ has been publishing long enough to have written about alternative music when it was still an alternative to the mainstream. It's put on by the College Music Journal, a long-standing publication of alternative music. CMJ has been publishing long enough to have written about Alternative music when it was still an alternative to the mainstream. They claim over 90,000 people attend the CMJ Marathon. It's got all of the requisite stuff like panels, guest speakers, film festival, and lots of music. Panels incude titles like "The Almighty Blog," "College Radio 2.0," and "Major Label Dilemma: Get In or Get Out of the Way." Heady topics indeed, with peeps from all over the industry gathering at NYU to talk big ideas. And you now MUST have a film festival if you do a music festival. There must be some indie stone tablets somewhere that dictate this as a rule, because most festivals these days seem to think music=film. So they'll descend on NYC this Fall to give us one of the founding festivals of modern-day music festivals. CMJ was one of the first to champion the multi-club, urban setting music festival that we see today in SXSW. The CMJ Music Marathon has announced the initial 2011 lineup! Check back for more details. CMJ tickets are on sale now at $149 to $305 depending on what package you choose. Find out more. The CMJ Marathon schedule allows you to sort by broadcast, film, panel, party and other categories, as well as choice mobile platforms for use like iPhone, Android and Blackberry. Facebook, Twitter and email are also options. Find out more.